Millennials who want to assign purpose and direction to their generation’s emerging political movement should look towards Washington State. 2016 was a journey for three friends who wholly invested themselves into their local politics and created the Young Democrat Committee in the state’s 48th legislative district. Not only a political team, their inspired activism is enabling Millennials of all kinds to make their first effective push into mainstream politics. I met with the three young political leaders who, despite current crises and the inaction of active politicians, hold a very hopeful, inspired outlook for the future, with new ideas that would allow for a truly democratic—and Millennial-approved—change to how we approach established American politics. 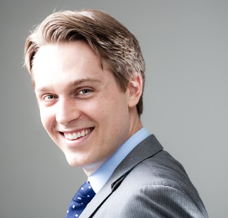 Brayden William Blaine Olson, the 29-year-old founder of multiple education software companies, was named Seattle’s Professional of the Year, and was the youngest entrepreneur in Seattle history to be admitted into Seattle’s Entrepreneur’s Organization. His path into politics began in 2014 with the Washington Jobs Act, which made him realize the importance of local politics, its impact on his community, and how much of a difference a person can make from within the political process. Olson is the Legislative Action Chair for Washington State’s 48th legislative district Democrats. Kyle Keraga is a recent college graduate who left a career in tech to work for the good of his generation. His interest in public service began in college, where he organized a 600-person voter registration drive, and was elected to run a $9 million-dollar independent student union. After graduation, Keraga worked as a program manager for Microsoft, until he left the company to work as a strategist for Olson’s State Representative campaign and a state delegate for Bernie Sanders. Aaron Tam is the Young Democrats Chair of the Washington State 48th legislative district Democrats. Tam also served as a delegate for Bernie Sanders until the state level. A recent graduate of environmental and political sciences, he is currently the Pacific Northwest Organizer for the Endangered Species Coalition and a Board Member of Carbon Washington—a grassroots, nonpartisan organization focused on accelerating the transition to a vibrant, clean-energy economy. Olson’s political focus now is Washington State’s silent housing crisis, which has become the most important, urgent issue facing Millennials in the region. While housing has been a local issue for years, it has become unsustainable for this generation, young people entering a housing market that is preventing them from making the natural transition to establishing foundations and starting families. 45% of those Millennials are reporting that they anticipate needing to relocate soon. The median appreciation in the County was $50,000 last year and, in the City of Seattle, was over $80,000. As a generation, Millennials are not staying in parity with those generations before, even when adjusting for inflation. Millennials are the first generation in 130 years for which the most common living arrangement is with parents, because they cannot afford housing. They make up the fastest growing homeless population in the country by age demographic, and represent 40% of the unemployed demographic in America. Astonishingly, Seattle is the 7th wealthiest city in the country for Millennials; and yet only 1.2% of Millennial residents—among the most educated generation in American history—is making $100,000 or more per year. The three friends raised a call for political action among Millennials—not by protesting and signing petitions, but by organizing a formal response and taking steps to get their chosen candidates into office. The election brought forward a wave of young progressives who believe in more democratic social policies, which they believe could enable the United States to do a better job of looking after its citizens. Many of these new participants in the political process, Keraga argues, are lacking a cohesive, strategic approach—an approach that he, Tam, and Olson believe they can facilitate and even provide. In Washington State, political appointments are made by active citizens within each community. In other words, 20 or 30 people can engage in the political process and have the deciding vote as to who will be their next representative or senator. But in other states, candidates require heavier financing, and most often an established PAC. With that in mind, Olson and his colleagues have developed a nuanced idea. The PAC, still in its conceptual phase, would receive funds only from individuals and deploy the funds to support Millennial candidates, events, independent expenditures, or anything it perceives as helping accomplish the missions of its supporters. For Millennial donors and others, depending on their levels, the PAC would provide them with access to candidates, special events, or simply the knowledge of how they are making an impact. Keraga observes that there are two types of money in politics—large donations from a small number of powerful people who want to maintain a system or the status of certain candidates, and small donations from grassroots movements that attempt to raise the bar of accountability through the influence of thousands of small donors. If there is any indication from the 2016 presidential election, the latter has become a driving force for potential change in politics. One of the big projects that the three of us are working on out here is a political app. We are exploring the opportunity to build an app that would specifically cater to Millennials, where Millennials could connect with groups in their area, could connect with their legislators, follow up on the causes they care about and follow both processes and ideas as they are shaped into organizations. That includes bills that ultimately get voted on, all from SMS, and your phone and only the issues you personally care about. All our partisan politics suffer from this same problem—a lack of understanding of modern technology. We’re doing so many things by paper and in person, when we could automate so much of the process and use our interconnected world to facilitate political dialogue in a much more effective and transparent way. Engaging people through technology could restore people’s faith in our democracy. Our app would provide information, accountability, and meaningful action, all in the same place. The way you rebuild faith in the democratic system is by restoring accountability and getting politicians to be responsive to what their voters care about. The closer you are to a real and true democracy, the happier people are going to be with the system, the more stable the system is going to be, and the more reliable it will be in terms of representing our values. In the current model, there are no political consequences. In our model, you’re going to get a different kind of representative government. It’s the weight of the politician being forced to ask him or herself, ‘Am I going to vote ‘no’ and risk alienating that many people?’ The effects of each vote will be immediately understood and impossible to ignore. The weight of each decision is no longer detached from the politics surrounding it. Olson, right, shakes hands with Gov. 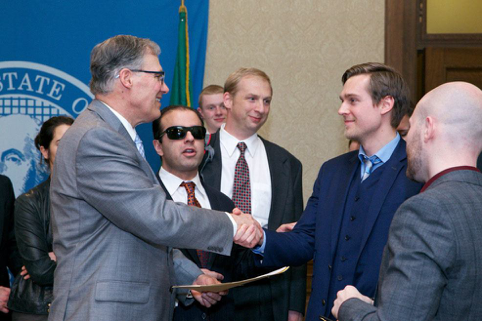 Jay Inslee. Photo republished from Seattle Weekly. The issue at hand is discovering and implementing these common tools, and facilitating the proper leadership to unite Millennials around these shared causes and overcome universal obstacles. Per Olson, the shortcuts that the last generation took in terms of financial deregulation; cheap and accessible energy; and detachment of politics from the education, civil rights, and housing crises of our time can be resolved only by a population that is engaged with ‘the same traditional systems that have been in place for a long time,’ as he describes. Millennials—digital natives, and the largest generation in American history—have an opportunity to make that change: “One where politicians truly can be held accountable, and where the interests of the government are also the interests of the people,” says Tam. It is inevitable that the largest generation in American history will change the culture of politics as they cross the threshold in the coming years. If you’d like to get connected to the Millennial political movement or simply learn more about these new ideas, contact Olson and his colleagues at MillennialPoliticalMovement@gmail.com. Since this article was first written, Brayden Olson has declared his candidacy for Congress in Washington State's 8th District. Visit www.braydenforourfuture.com to learn more about his campaign.